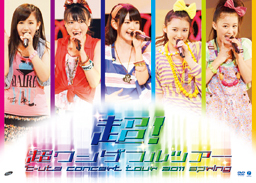 The DVD cover for C-ute’s 2011 spring concert tour titled C-ute Concert Tour 2011 Spring Chou! ~Chou Wonderful!~ has been released. The cover is really bright and colorful mostly thanks to the title that’s taking almost the whole bottom of the cover without distracting from the members, but also thanks to their Momoiro Sparkling outfits that are full of colors and patterns, and I really like how they seem to play on C-ute’s colorful image that has been convayed in the past 2 singles and in this concert tour since it fits the happy image they are having recently. The title of the tour is really one of my favorites since it’s really colorful and written in a nice futuristic font that reminds me of their album’s cover that has the same name, and they chose to put a montage of pictures of each member singing in rectangular boxes with colorful borders that are colored according to the title, and I really like how they are posititonned since unlike other covers, this pattern allows every girls to have her share and we don’t see anyone outstanding the other or having a bigger picture. Overall, I really like this cover since it follows the image C-ute is having recently with everythin being bright and colorful, and the combination of the title that’s separated from the girls by a white halo and the girl’s happy expressions make a perfect match. Hopefully everyone who was able to catch this concert when it was streamed on YouTube will want to own a copy of the DVD, and I recommend all C-ute fans to reserve a copy since this is one of C-ute’s best concerts thanks to the awesome setlist it had and their amazing energy. I love how everything C-ute has been doing lately has been so colorful. but question: we don´t know the setlist for the DVD and Bluray already, right?